Thanks to all who came out to Hump. on Wednesday night, Andrew Top-Hat and I had a great time playing some new tunes for you. I am gearing up for a great weekend in Provincetown. 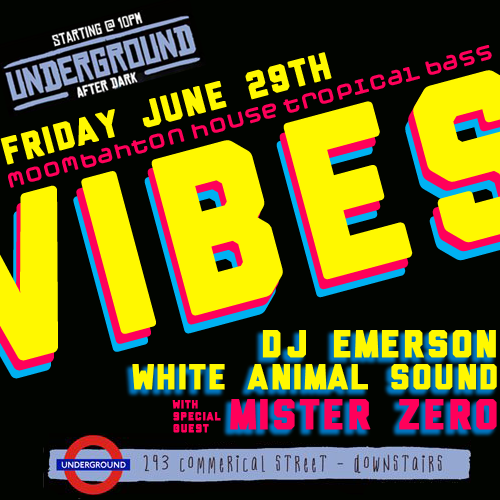 Tonight I will be at the Underground joining White Animal Sound (DJ Emerson) on the decks at the Ptown Underground. Expect moombahton, tropical bass, some hard hitting house and Vibes. Saturday night I may broadcast Tru & Deep but it is still up in the air. Sunday night I will be dropping R&B, gospel, funk, and house classics to save your soul at Church. Church resides at the Grotta bar inside the newly renovated Local 186 (formerly Enzo). Wednesday Hump. returns to Watermark in Asbury Park NJ and it is going to be an amazing night. I can’t wait to drop tunes with Andrew Top-Hat! This entry was posted in events and tagged Andrew Top-Hat, Asbury Park NJ, Church, DJ Emerson, Grotta Bar, Local 186, Ptown Underground, Vibes, Watermark, White Animal Sound by mister zero. Bookmark the permalink.